Spring is knocking on the door here in NYC which means soon after we’ll be back to sun-kissed skin, skimpy swimwear, and lighter wetsuits for the surfers of the North East. PHYN, a new brand of lightweight functional surfwear created by New York surfer and fashion designer Lisa Flannery, is looking to fill a void of figure flattering, fashionable but functional protective surfwear. The capsule collection, scheduled to launch this May, consists of rash guards, spring suits and surf shorts, which are ideal for conditions that are just a bit chillier during your spring and summer sessions. We caught up with Lisa to talk about the exciting new line. What inspired you to start surfing? I was out in Ditch plains with a bunch of friends. I had just separated from my ex, and was lying on the beach licking my wounds and watching my friends surf. It looked like a lot of fun and a good way to get my mind off of things. I took my first lesson in Long Beach, and the first thing I noticed was that when you surf, you really can’t think about anything but the wave. Whether it’s the one that’s coming to you, the one that you’re on, or getting back out into the line up, you have to be pretty focused. The first wave I was pushed into I got up and rode all the way to the beach and I was hooked. Little did I know it would never be that easy again! I spent a lot of summers in Montauk, have surfed in Costa Rica and the Dominican Republic, and the past summer I spent in Rockaway, which is a very different wave than Montauk. It’s like being a beginner all over again. Surfing is a good teacher. I feel that everything I learn in the water can be applied to daily living, and it has definitely made me a better person, better able to handle life’s ups & downs. Tell us about your inspiration behind your company and the capsule collection. The first summer that I started going out regularly, as soon as the weather got hot, I started shopping for a lighter option from my spring suit. There wasn’t much out there. I got some boyish looking board shorts and a basic rashguard. I found the legs of the shorts to be too long and too narrow and constricted my range of motion. I tried surfing in a bikini a few times, but got board rash and found myself always worrying about how my suit was situated. I also noticed that all of the hours I was spending in the sun was taking a toll on my skin. I was craving a lightweight option that was flattering, protective and functional. The wheels started turning and PHYN was conceived. So far, I’ve developed 5 pieces that use a combination of lightweight materials and offer different options for coverage. The seamlines on all of the pieces have been created to give a great fit and to flatter a variety of body types. Both tops have extended sleeves that don’t interfere with grip. The short and legging have zippered pockets to keep incidentals. The one piece suit has a faux bra for a better fit and capri length legs to keep the upper part of the legs from being over exposed. The collection is meant to offer options and can be mixed with other pieces in the collection or the wearer’s own. What sets PHYN surf and swimwear apart from its competition? What’s different about PHYN is that it offers lightweight coverage in flattering, feminine silhouettes. Having worked in the fashion industry for over 15 years, with 7 years in the International market, I’ve brought my experience and knowledge of fitting to the table. I know that women are concerned about how they look, and PHYN will allow them to look good while being able to perform. 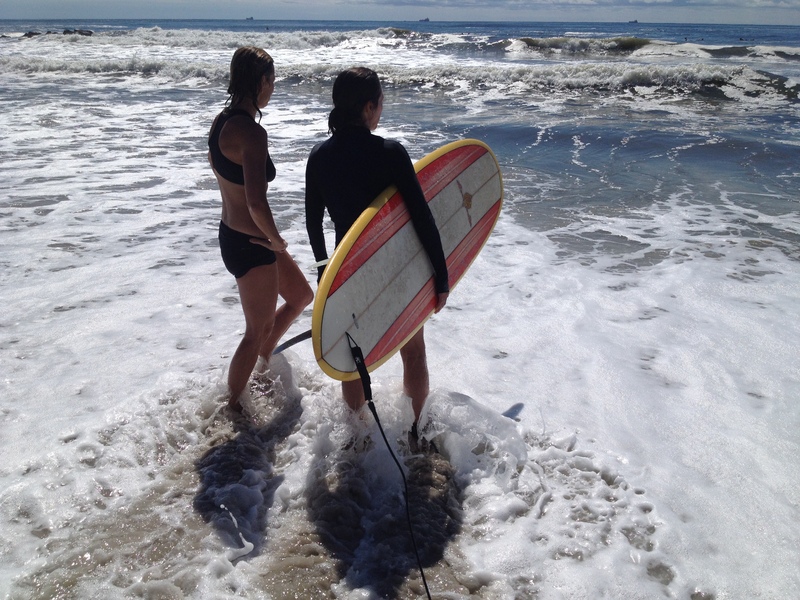 It is the only line of Women’s Surfwear, that I know of, that specifically addresses the needs of a warm weather / warm water surfer. Give us a little insight into your design process. What are your major design influences? I have always loved fashion and good design, and have always been aware of what is on my body and how it functions with my lifestyle. Living in NYC we are lucky because some of the worlds most creative people live here, and we get to witness that creativity and innovation just by walking down the street. I often say that the best fashion show is on the L train on a Saturday night! But as I’ve said above, fashion needs to function. And for me, it needs to be comfortable as well. Being a surfer with a fashion background, I’ve put a lot of thought into what needs aren’t being met. There’s nothing worse than sweaty rubber on a humid day of 95 degrees! Where do you see PHYN heading? I have so many ideas, I wish I had the time to implement all of them! I see PHYN as a lifestyle brand, growing slowly but surely, expanding on the surf collection and then adding beachwear and casual sportswear. Currently I am manufacturing here in NYC, and want to continue to employ local sample rooms as we grow. The environment is a main concern for me, so I want the entire process to be as sustainable as possible. That can be a challenge for a small company. I also want to continue to be a part of the growing surf community here, integrating the brand with the culture that is unique to the New York experience, which is where it all started. New York is the platform where the brand will grow from. That said, I feel that the brand ethos carries across the world – PHYN has gotten a great response from women surfers in California, Bali, Sweden and the Caribbean as well. I want to offer a functional product that looks good, feels good and makes sense to a woman whose lifestyle revolves around the water. That’s what PHYN is about. Thank you Lisa for talking with us. We are excited to sport PHYN this spring and summer in our surf sessions. Photos currtesy of PHYN. All rights reserved.